Yesterday I installed the Solarwinds MP for SCOM and began by only selecting 9 interfaces to monitor. 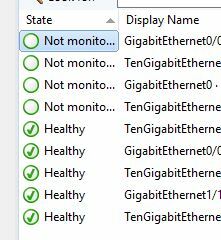 Can anyone help me as to why only 5 interfaces turned green health automatically and 4 remain ‘not monitored’? I know these interfaces are up. What can be done to get these to a green health monitored state?